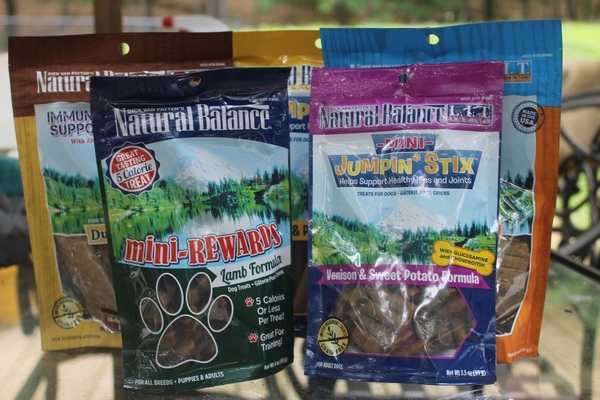 Natural Balance Pet Treats: Delicious Rewards for your Pups! My dogs were doing proverbial back flips this month with all the goodies coming in for them! They were super excited to find out what was in the package filled with Natural Balance pet treats that we got for review. They could hardly wait until I took the pictures! Please excuse the messy background in this next one. I couldn’t convince the dogs to stand in front of a nicer spot. When treats are involved, they’ll only take so much of my picture-taking shenanigans. This is there”what’s that you have in your hands? Is it for me? It’s for me, right? Come on, just say it’s for me! Give!” face. Let me tell you a bit about these new Natural Balance semi-moist treats. First, they’re from a company that I already know and trust. I’ve given my dogs Natural Balance food in the past, so I’m happy to see them making such great treats too! All of the semi-moist (which, by the way, means that they’re a softer consistency than other soft treats) are made from limited ingredients. Basically, expect to see the same high-quality ingredients that go into their dog food. For example, the first ingredient in the Hip & Joint Jerky – Chicken Formula is, as it should be, chicken. Another thing that I completely love about the Natural Balance treats is that they have different formulas, such as Hip & Joint support. My two girls are 12 and 13 now. While Maia is pretty good about taking her glucosamine pill without a fight, Tasha is another story. We have to hide it in treats, put liquid on her food and other tricks. The Hip & Joint Jerky is formulated with Glucosamine and Chondroitin, so no tricks needed. Just treats! Cooper is younger, but seems prone to doggy colds and stomach bugs. After we almost lost him two years ago from a stomach bug, I’ve been super paranoid. The Immunity Support Jerky has antioxidant vitamins C & E to help support a healthy immune system, so I feel good about giving Cooper these treats! 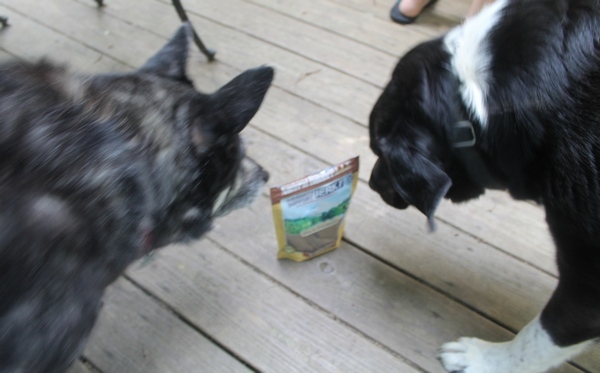 As you can see, both Tasha and Cooper were very intrigued by the packages and couldn’t wait to dig in! I finally stopped torturing them for the sake of photos and gave them their goodies. While I can’t tell you how they tasted, I can tell you that my dogs loved them and constantly begged for more! Tasha points with her nose at the counter where the treats are when she wants one. She did a lot of pointing until we ran out! With three dogs, the treats went pretty fast. Since they’re made with such great ingredients and contain no artificial junk or useless grains, I didn’t mind indulging them a bit more often than usual. The great thing? You don’t have to take my word for it. Natural Balance L.I.T- Limited Ingredients Treats- come with a 100% guarantee that you and your pets will love them. 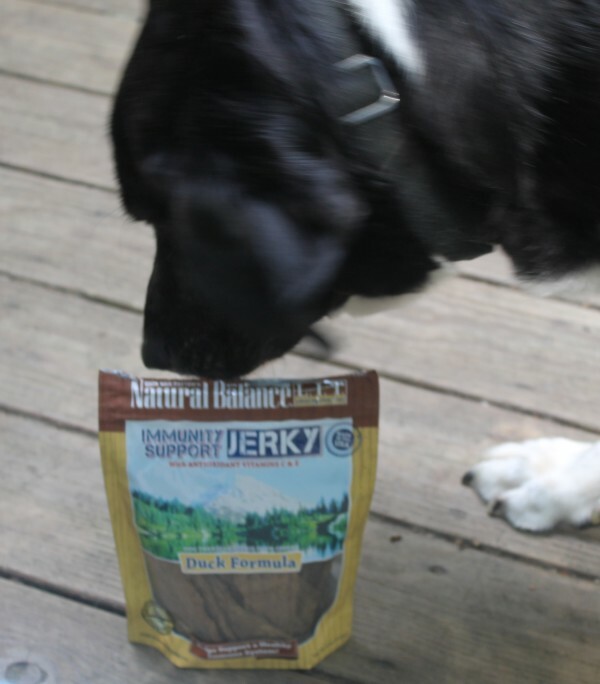 Check out all the great new Natural Balance treats to find the perfect one for your pooch! Follow Natural Balance on Facebook and Twitter to keep up with news! Which flavor do you think your pups would love? I think my dog would enjoy the Duck Formula! She would like that these are soft and chewy, too. I love all these pictures you posted. 🙂 I know that Natural Balance has been around forever and my cats most certainly enjoy their wet food, but I haven’t bought the dog treats yet. If it’s not chicken jerky, my dogs don’t touch it. I will have to give these a try though. Thank you. 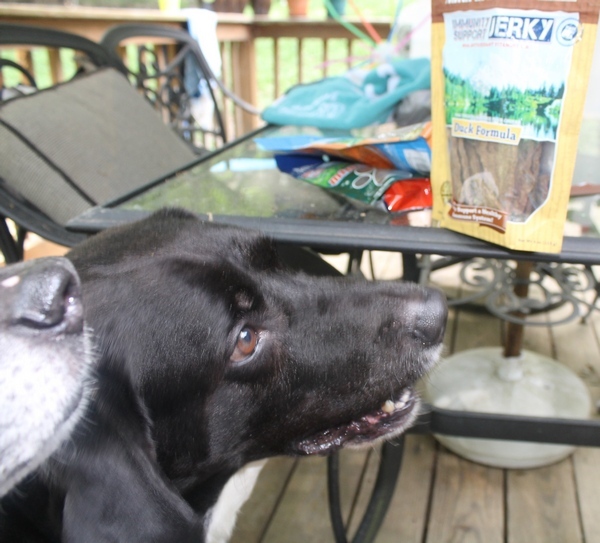 My dog is getting old so I would love him to try the Hip & Joint Jerky. It is nice to know that Chicken is the first ingredient in these dog treats. I must give my dog healthy dog treats, and this brand is great in providing healthy dog treats. Plus I like that the Hip & Joint Jerkey treats have Glucosamine and Chondroitin, and this is very good very my dog’s joints. My old girls loved these treats and I was so relieved to find a way to get some Glucosamine into my Shepherd. She’s a stubborn girl when it comes to taking the pills, but it helps so much! I hadn’t heard about this brand before. I am going to see if they have them at any stores around here, thanks! I will have to give these a try with my dogs, I like finding healthy treats for them.